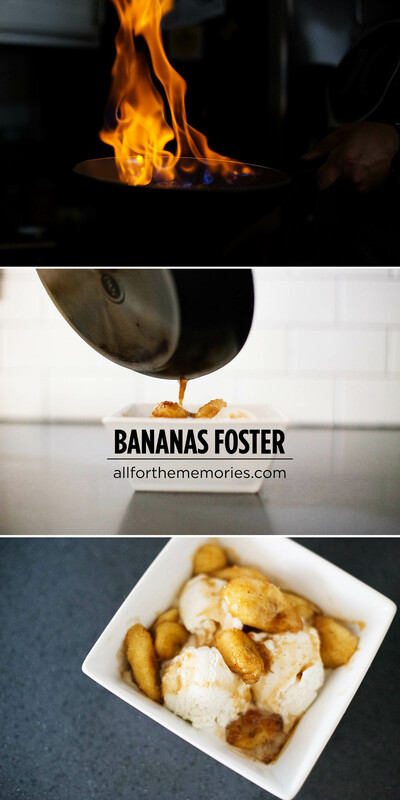 We went through a big Bananas Foster phase a couple of years ago. The boys asked for it all the time. 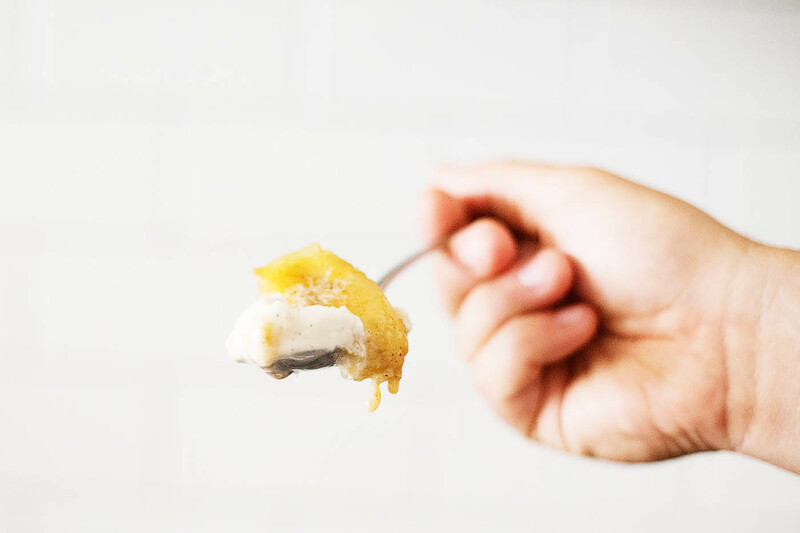 It’s a fun dessert that seems a little intimidating, but it’s really not! It’s fun to make to impress your family or to make for friends when they’re over for dinner. Note – this post contains affiliate links. This recipe is for 1 large dessert or 2 small. 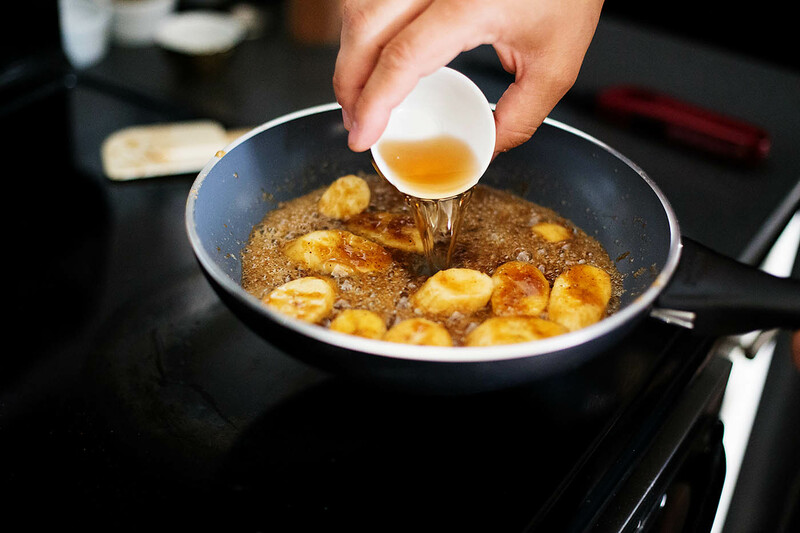 This is best made in small batches (plus you’ll want to see the flambé more than once). 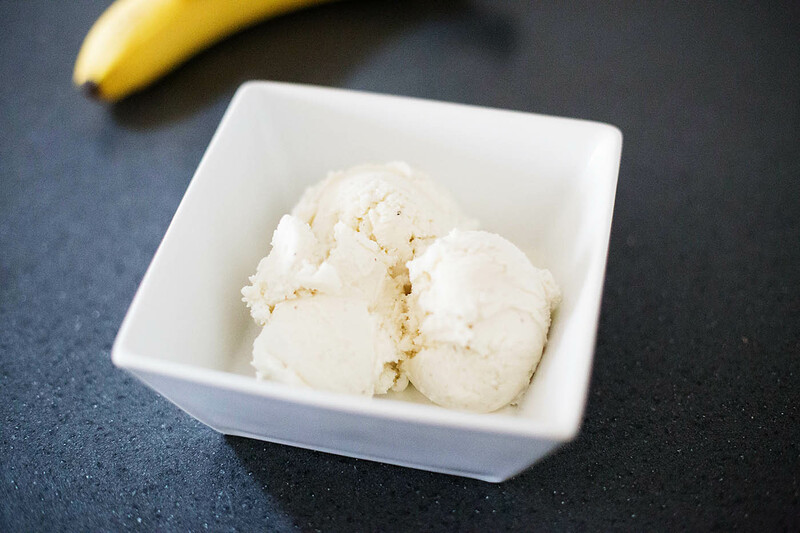 To prep, I like to scoop all the ice cream ahead of time and put the bowls in the freezer. 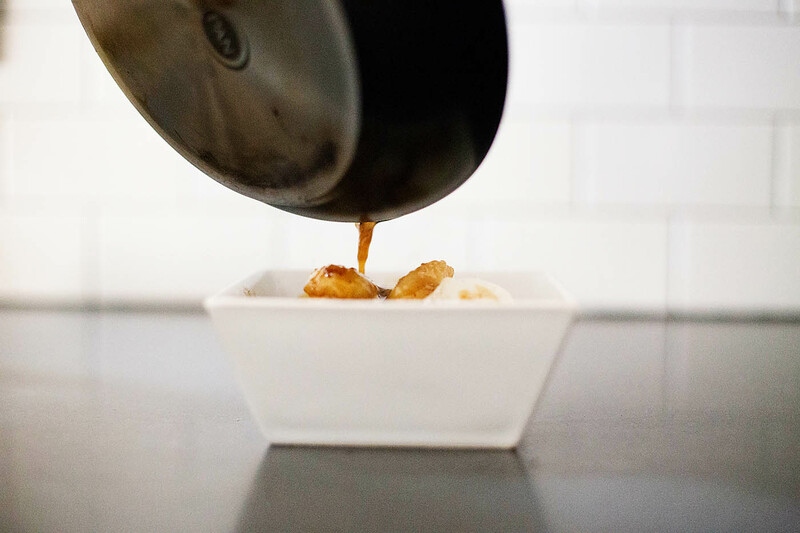 That way they’re ready when the bananas foster is and you can just grab and go. 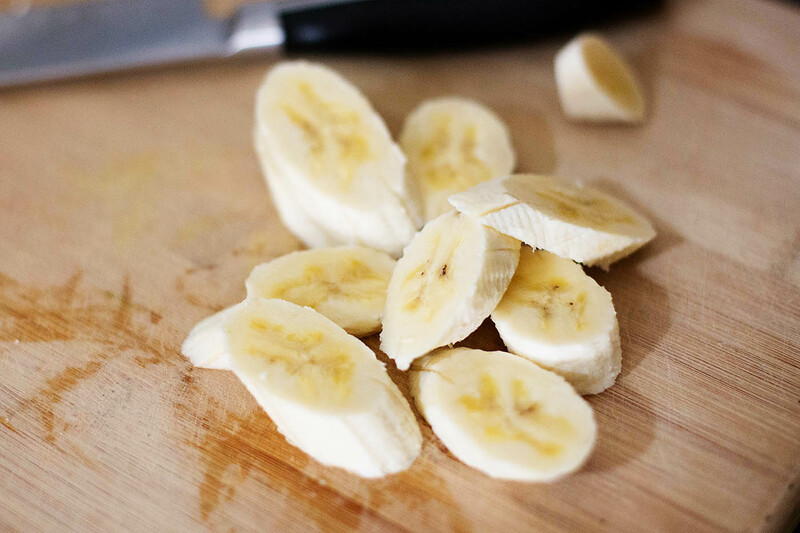 First cut up a banana. Doesn’t matter how – you can be fancy, or not. 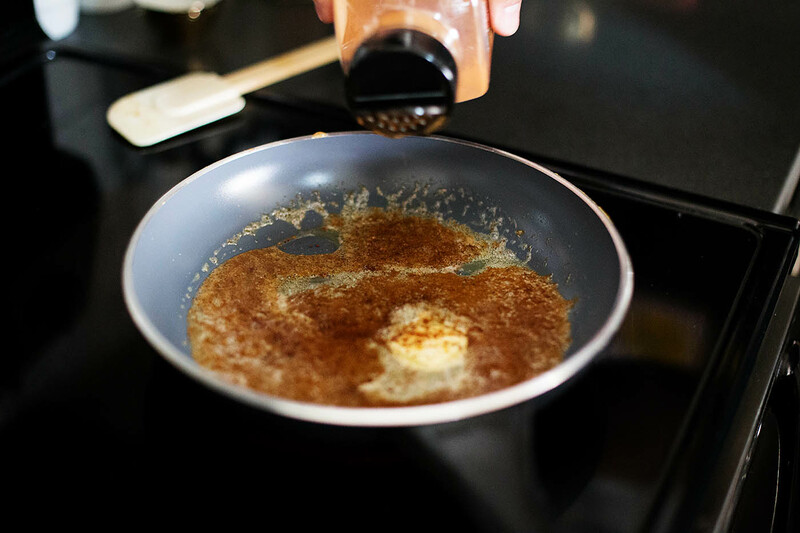 Then add 2 Tbsp of butter, 2 Tbsp of brown sugar and however much cinnamon and nutmeg you like (or don’t add it at all if you don’t want to) to a pre-heated non stick pan Medium – Medium High should work well. I just got a GreenPan (my 13 year old asked for it) and it’s worked well so far. We usually just use a cast iron, but the non stick works better for us for this. 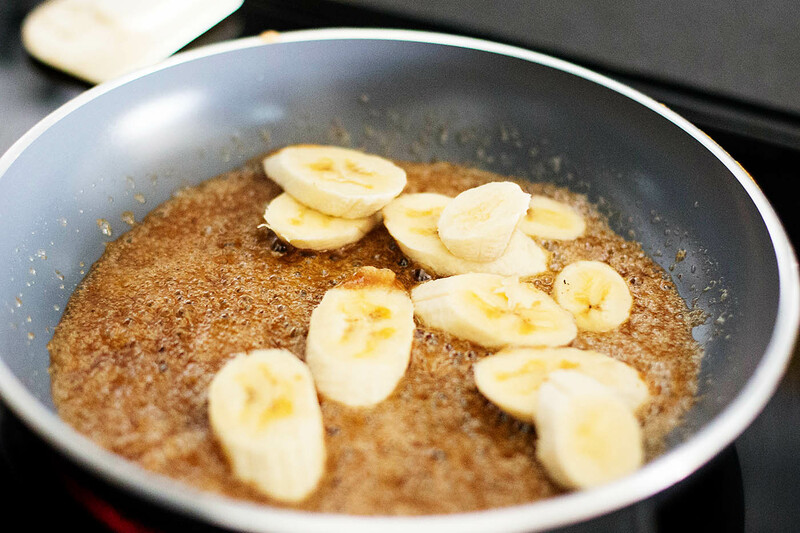 Once the brown sugar/butter mixture is nice and bubbly – add your bananas. Stir and cover with the deliciousness. If it’s bubbling, the bananas are covered and hot then you’re ready for the action. 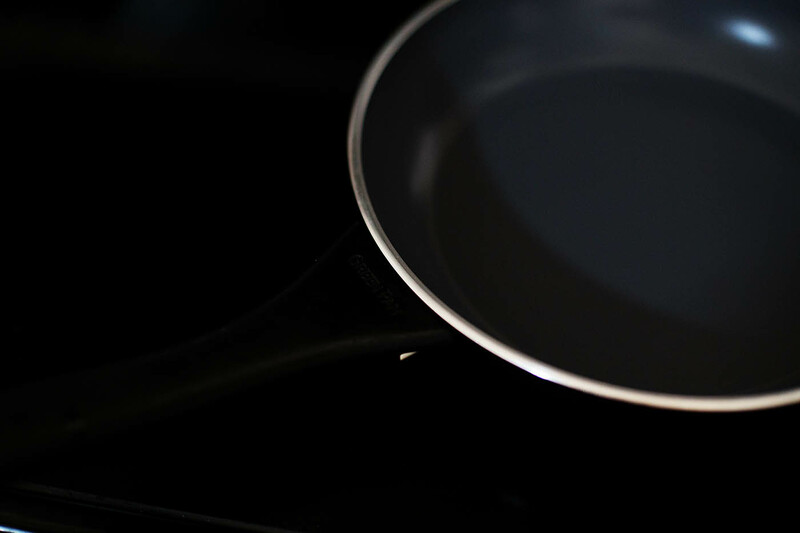 Remove the pan from the heat source and add 2 TBSP of dark rum to the pan and allow to heat up just for a few seconds. 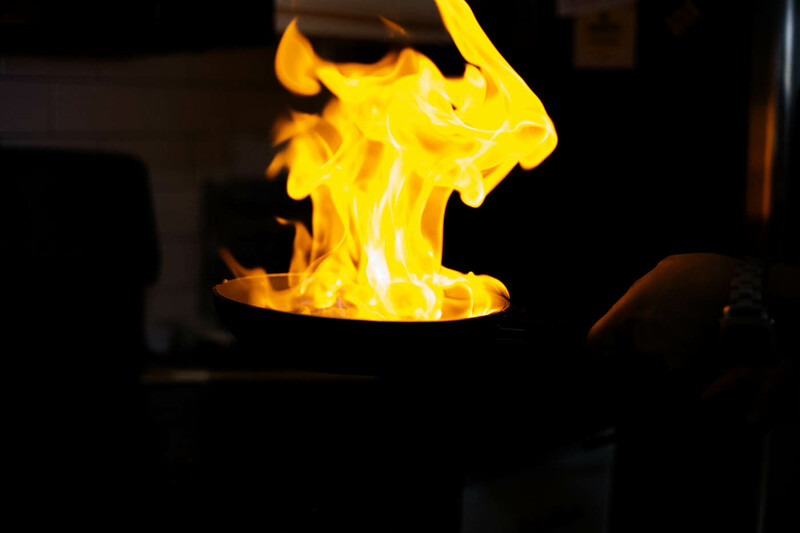 Right after that, ignite the alcohol with a long stick lighter (don’t let kids do this, make sure you’re safe and all that – here’s info on safe flambé practices). When the flames reduce you can return the pan to the heat source and swirl until it goes out. 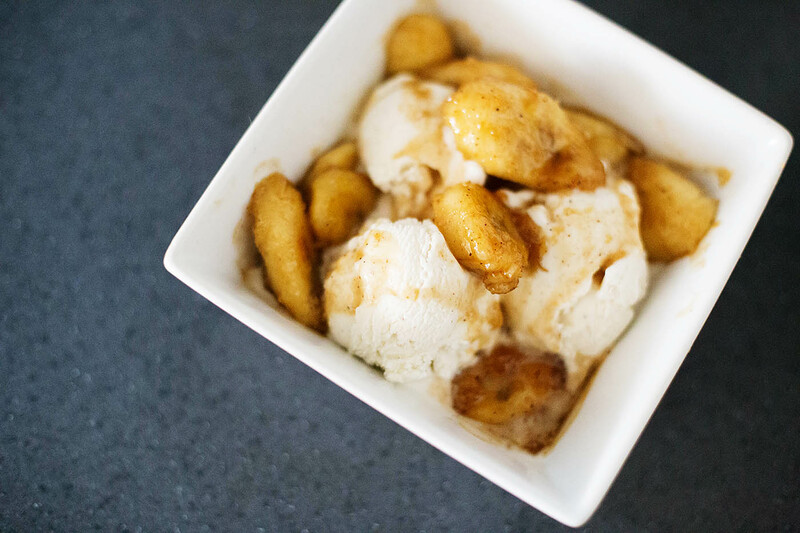 Grab your pre-scooped ice cream and pour on top. 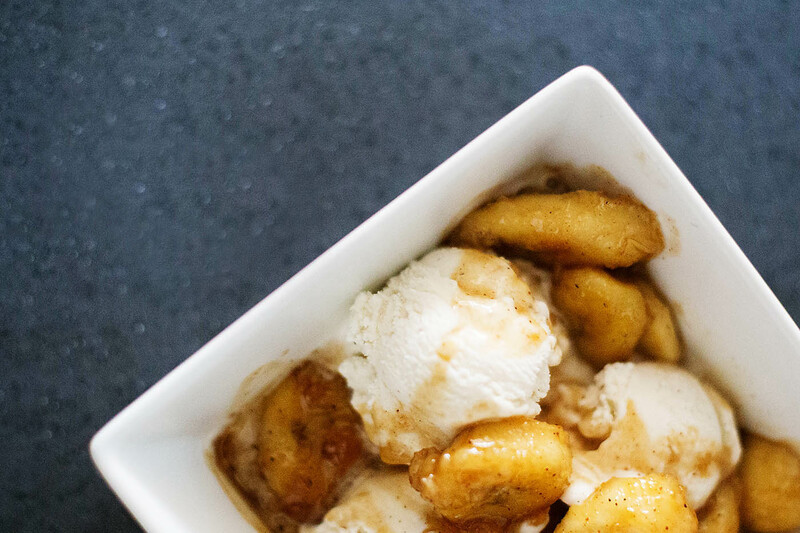 Bananas Foster doesn't have to be intimidating, it's simple, has a big "wow" factor and most importantly, is delicious! 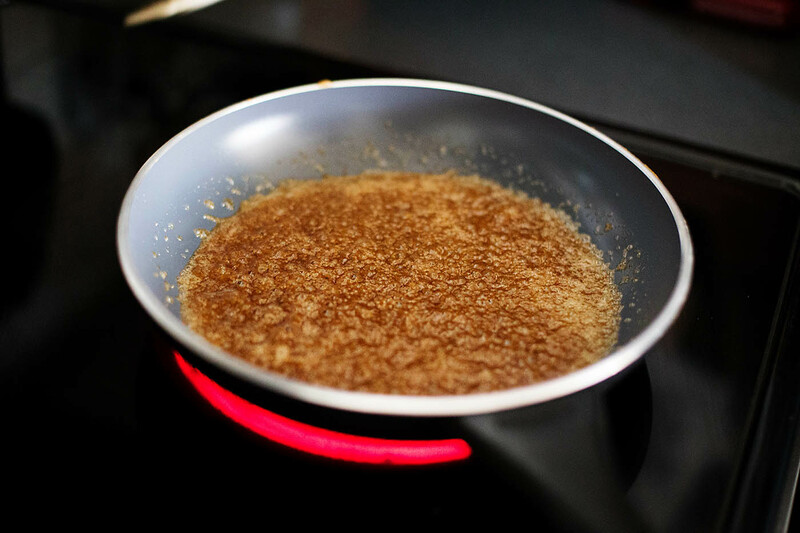 Place butter, brown sugar, cinnamon & nutmeg in a pre-heated non stick pan. Stir until combined, melted and bubbly. 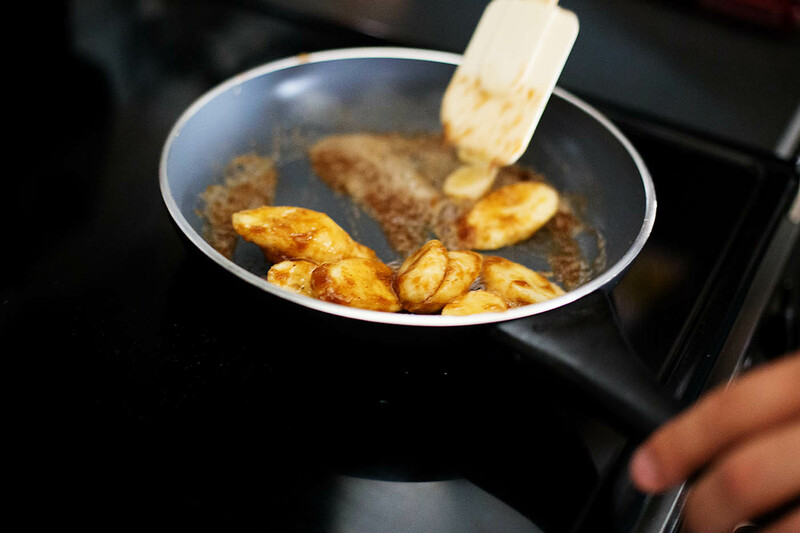 Add bananas and stir to heat up and coat well. Remove pan from heat and add rum. 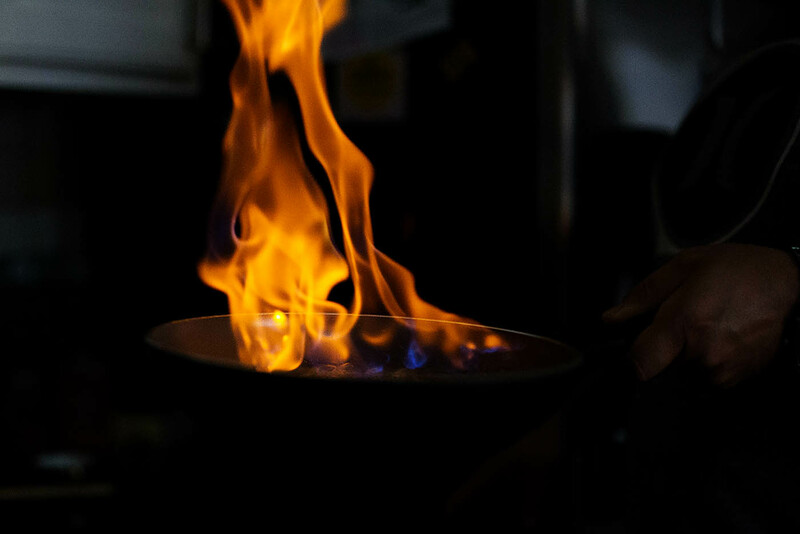 Once the flame goes down a bit you can add the pan back to the heat source and gently stir until the flame is extinguished. Pour over ice cream and serve! 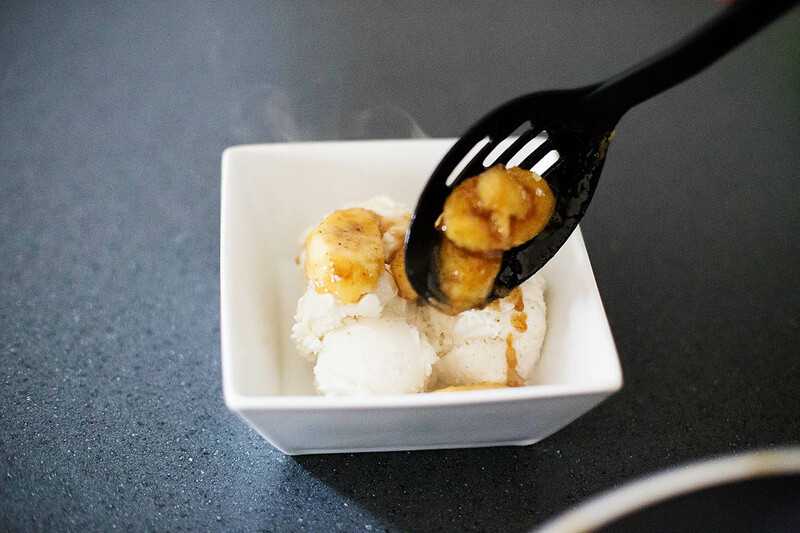 Have you tried making bananas foster before?